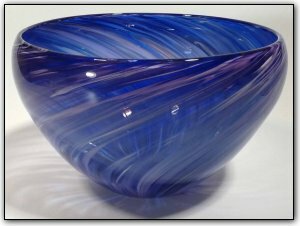 This low bowl features many shades of pretty purples and beautiful blues, with white highlights swirling throughout. The interior has a very intense deeper blue center. Please note that due to the deep intense colors, there are more reflections in the photos of this bowl than most, but they are only reflections in the photo and they are not on the bowl itself. The bowl is absolutely flawless and stunning!